I want to cut the rear section of my frame so the TT2 rep seat looks better once fitted - see pic below. I know some of you guys have cut the frame for various reasons, cutting that rear section loop under the rear of the seat, is it an issue frame structure/strength wise? My guess that part of the subframe is just there for plastic tray that was there? Anyone thoughts before i take the angle grinder to it! That whole rear section is just to support you and your lady friend. You can take a lot of tubing out of it and still be good. Look at some of the later model frames, and you will see a lot less frame in back, especially if you are putting on a single seat. It looks a lot like legacy ideas to me. Hej Clive, wy not use a 750 f1 replica race seat, that wil fit just fine, no cutting. thats almost the same, but a littel bit wyder at the and, and a bit longer. you're right. I did this a while ago. Due to lot of things I didn't finish the project sofar. its nearly finished, 10 years working on this thing. Wow....that's awsome.Is there a thread anywhere about your build. What is left of the Sport? The rest comes from a 748R (rear end and part of the frame), 916 (front end, shock) , 996 (wheels , now I sold the 3 spokers and got a 5 spoke version), 999 (front brakes and Mastercylinders) ; the bodywork is nearly finished and it will be a Mix of 996 (seat and tail) 1098(front cowl, & headlamp), "supertwins" race bellypan, Supersport "mezzacarena" Faring Panels and Sport "nuovo" (Tank, is VERY narrow). I have already the dashboard made and ready with a digital speedo (chinese), idiotlights, oil pressure & temp (VDO) and Revs (the revtacho is coming from a Yamaha RD350) and Shift light, but I am not entirely happy with it, so I dont know yet if I will keep it or go for something less complicated and more contemporary. It started as a joke and half Elefant Engine and I got carried away. very nice bike. Indeed you went all the way. you finished, where I just started a long time ago. changed the frame end to adapt the S4R link instead of the original cantilever. But first I have to finish some other projects such as proper lathe to machine parts. where are you in Holland? i'm currently in Amsterdam on business for 2 weeks. hoping to get to Assen for the dutch TT before i fly home. I'm in the eastern part of Holland app. 100 km from Amsterdam. It's small town called Holten, directly near the highway A1/E30 Amsterdam-Berlin. Visiting Assen is also my goal, probably by bike (907) together with my friend on his 750ss or 888SP3. I heard great things about New Zealand. my son was there a couple of months as a apprentice in Invercargill on a dairy farm. PM me if you want to meet, for instance in the weekend. how are you're TT plans? maybe we can arrange something. it would be nice to meet you. Angelix - That is a most ambitious build. Awesome. ducbertus - a lot of respect for you daring to cut the frame so far back. I'd love to see the finished product. Has anyone else got photos of frame cut jobs? 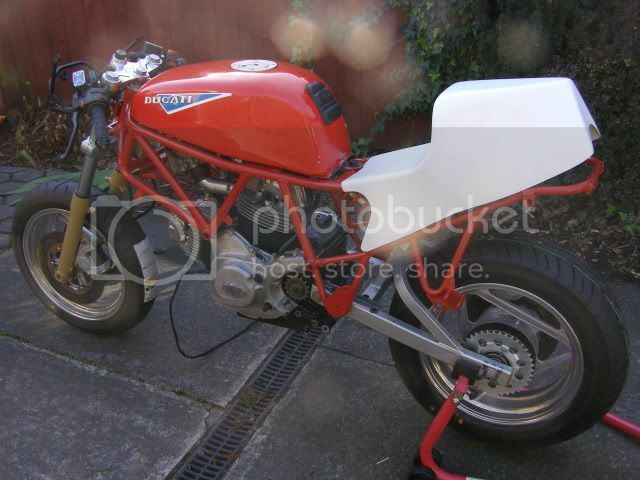 I'm considering cutting an SS frame down for a TT2 replica, and would be interested to see what has worked for others.